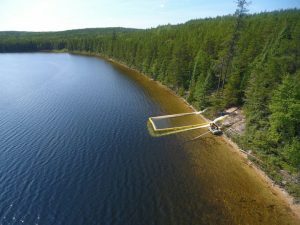 As reported by Lesley Evans Ogden of the Canadian Press, researchers were in northwestern Ontario recently spilled diluted oil sands bitumen and crude oil into a lake to study how the ecosystem, from microbes to fish, responds. The pilot project, known as Freshwater Oil Spill Remediation Study, is being done at the International Institute for Sustainable Development Experimental Lakes Area (IISD-ELA) southeast of Kenora, Ont. The reasoning behind the study is that there are currently gaps scientists knowledge regarding the impacts of oil spills on freshwater ecosystems. North America has the largest network of energy pipelines in the world, and periodic oil spills from pipelines do occur. Researchers will also explore the effectiveness of oil-spills remediation (clean-up) techniques in a study conducted on the shoreline of an IISD-ELA lake. Given the significant knowledge gaps, it is hoped that the groundbreaking project undertaken by IISD-ELA that will answer the questions about what happens when oil enters freshwater systems. Vince Palace, the scientist who is leading the experiment, said the area is typically known for experiments involving a whole lake, but this work is different. “We’re using small enclosures to contain that oil,” he said. The oil was spilled inside four yellow floating boomed rectangles, each along 2.5 metres of shrub and sphagnum moss shoreline. The enclosures stretch 10 metres into the lake and contain 20,000 litres of water. Curtain-like sides extend down and are carefully affixed to the lake bottom with lines of sandbags filled at the local gravel pit and placed by a small army of students in waders and wetsuits. The spills were 1.25 litres each and were to be left for 72 hours then cleaned up by professional oil-spill responders. With any oil spill, even after clean up, there is residual contamination. “We’re interested in looking at the impact of residuals,” Palace said in an interview before the experiments were conducted. Palace’s team will study impacts on microbes, algae, zooplankton, insects, wood frogs, and fathead minnows by sampling soil, water, and sediment before and after the spill and clean up. They’ll look for direct impacts from fouling and poisoning, but also indirect effects on fish survival and reproduction. Palace notes that when oil spills, social pressure and regulatory commitments create a huge drive to clean it up. “The problem is, in the shoreline environment, when you spill oil, often times the removal of it can be just as damaging as the impact of the oil on the shoreline environment itself,” he said. Soil removal, compaction, and moving heavy equipment into remote areas are ecologically destructive. “In marine environments, there are microbes present that will respond to the presence of oil to degrade it. So it may be that there is a benefit to leaving the oil in place to degrade,” Palace said. Diluted bitumen’s behaviour in freshwater has been studied extensively in laboratories. Project collaborator Heather Dettman, senior scientist with Natural Resources Canada in Alberta, has simulated spills in laboratory wave tanks using North Saskatchewan River water. Her studies have manipulated variables such as wave action and temperature, but not things like wind, rain and sun. So, when it comes to understanding how oil behaves in a lake “maybe we’re missing something,” she said. This is “the next step up” from the lab. The researchers hope to find out if such oil-eating microbes exist in the freshwater environment of oil-naive Boreal shield lakes.